The inaugural Blue Oval Rally in Buffalo, Missouri has gotten things off to a great start. We joined forces with the Hillbillies & Hot Rods Hot Summer Nights show, and were thrilled at the attendance, both by participants and spectators. And the best part – the show raised $2,600 for local charities! The weekend started on Friday night, and despite mother nature’s best efforts to wash us out, quite a few folks participated in the cruise around town – much to the delight of Buffalo locals and shop owners. Buffalo Blue Oval Rally attendees got to see a beautiful black 1968 Shelby GT-500KR. 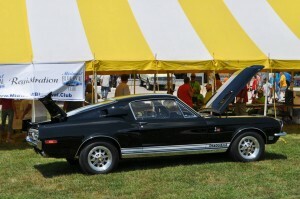 On Saturday, roughly 140 cars thundered onto the Eagle Machine Shop show grounds, and among them were a good number of mean FoMoCo machines. A live band, dunk tank, and other festival activities kept people entertained, but no doubt there was much more excitement generated by the burnout contest that gave the tire retailers on site very big smiles. To see a complete gallery of photos from the event, visit our Facebook page. Thanks to everyone who came out and supported this event. We heard comments that the square had not seen so many people in years, the Shriner’s had to re-stock their food truck three times, and we even received some compliments from some “brand X” guys about how well coordinated this year’s show was. We were really pleased at how well everything went down, and look forward to next year. But our favorite part was giving back to the community, and we were so happy to be able to donate $2000 to the Dallas County Shriners, and $600 to the Heart to Heart organization. 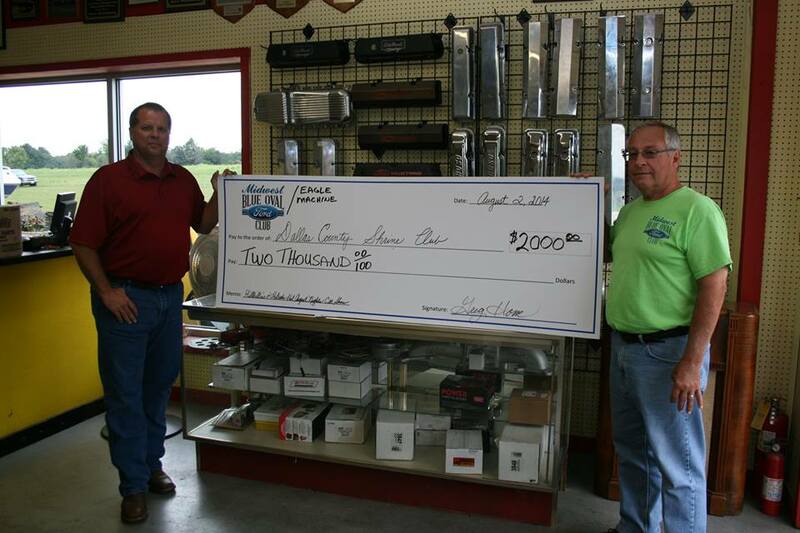 Midwest Blue Oval Club President Al Rutherford presents a check for $2000 to a Dallas County Shriner representative.